Photos by Travis Neely GCU News Bureau A herd of purple-clad GCU staff, professors and students were among the many volunteers who participated on the second day of the annual Back to School Clothing Drive. 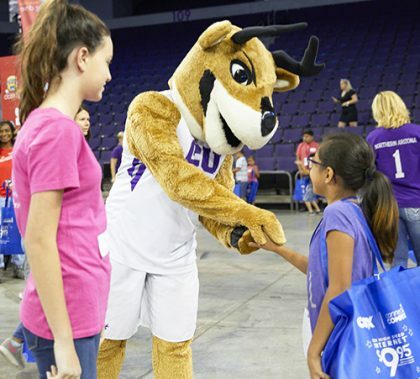 Some volunteers at GCU Arena helped children fill enormous bags with clothing and other goodies while Thunder, Dance and Cheer team members and GCU soccer and volleyball players revved up the crowd. Upstairs, GCU College of Education Dean Kim LaPrade signed copies of her book, “Thunder’s Vision,” and everywhere, people smiled warmly at shy children and grinned with every glimmer of joy.